How is it the old saying goes -- the best things come to those who wait? The wait for the Harry Potter eBook series to go on sale has certainly been long. Originally we were expecting them back in October. But, for whatever reason that date slipped, and slipped, and now finally today is the day. The eBook store over on the Pottermore site has finally gone live, for Muggles across the world to get their electronic fix. As previously reported, the books are available to read in your Google Play Books application, right on your Android device. In fact, you can also purchase and read them in your Kindle application, right on your Android device. The only drawback remains, that you can only actually purchase anything from the Pottermore website. So how do you retrieve your fix of Hogwarts from there? Stick around, we've got you covered. First though, to pricing. There has been a mixed reception to the prices of these books across the interwebs today. Some believe that the prices are too high, especially given the number of people who already own the paper copies worldwide of the series which began 15 years ago. Look at it another way though -- how long did it take the mighty iTunes to snag The Beatles' back catalog? Did people still buy it when it did appear despite the music originating from the sixties? Pricing isn't actually as steep as some would make it appear. The first book in the series, Harry Potter and the Philosophers Stone, cost me £4.99 (about $8.) Cheaper still than buying the paper copy in most book stores, and not extortionately over-priced when compared to some of the better selling books in the Google Play Store. Lots of us don't own the paper copies -- we have them in our house, but would I really want to carry around a 3-inch thick book in some cases? Pricing out of the way, let's take a look at the buying process. The first thing you're going to need to do is create a Pottermore account. Simple enough, enter details, payment details, password etc and you're away. Buying is easy, just like buying just about anything else online. When you've bought your first book, you're taken to what can only be described as your library. All your purchases, right there for you to download. The good news is that each book can be download 8 times, so if you have a lot of different devices you use regularly, you're pretty well covered. From the download screen, you choose how you want to download. There are options for a range of e-Readers, including Kindle, and Google Play. Google Play is as good an option as any, especially if you only intend to use Android devices. 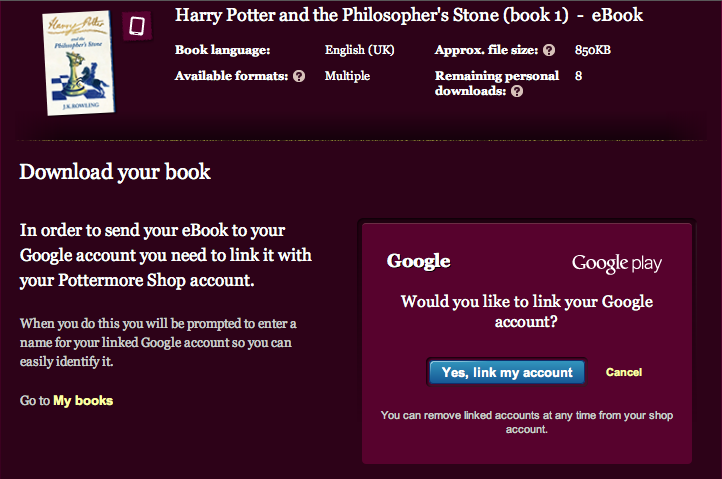 The facility is there to link your Google account to your Pottermore account. By doing this, your purchases will automatically appear on any of your devices running the Google Play Books app. Thats it. It's really that simple. Granted, it would be even more simple just to be able to buy it from the Google Play Store, or the Kindle Store, or the Nook Store -- you get the idea. But, this is what we've got, so we're stuck with it. 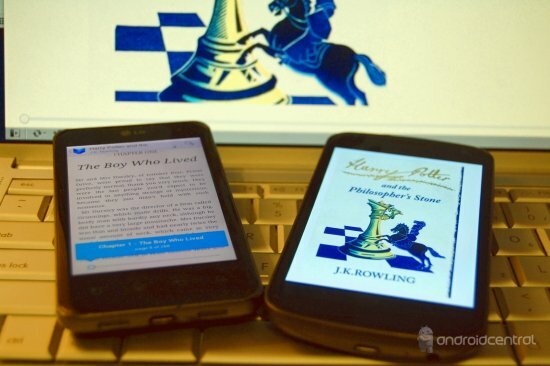 The good news is that once you've bought your Harry Potter books from Pottermore, you don't have to worry about any undue steps to get them onto your Android device. Now, if you'll excuse me, the Quidditch is on.